Taught by local fireman hero Mitch McKnight. Free food and drinks. Learn how to be ready for emergencies, meet your neighbors and make friends. CERT Training promotes a partnership between professional emergency services and the people they serve. The goal is for emergency personnel to train members of neighborhoods, community organizations, and workplaces in basic emergency response skills. 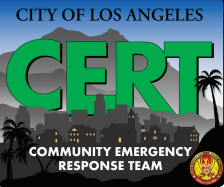 CERT trained members enhance the emergency response capability of their neighborhoods and workplaces. If an earthquake, fire or other emergency overwhelms or delays the community’s professional response capabilities, CERT members can assist themselves, their families and others, by applying the basic response organizational skills they learned during training. Following an emergency event, these skills can help save and sustain lives until help arrives. CERT skills also apply to smaller scale daily emergencies.